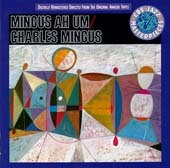 It is incredible that Mingus can dredge out of the contemporary slough the potency and healing grace of his music. Pieces like 'Fables Of Faubus' 'Goodbye Pork Pie Hat' and others are miracles of a kind. They are there, available, God knows, for anyone of those not so bugged by the crazy barrage of the Communication of Nothing that they can still hear. Poetry and music are for those with straight connections between ears, eyes, head, heart, and gut. Columbia CG 30628 (197?, 2LP) as half of "Better Git It In Your Soul"
Lead sheets to all compositions except 'Bird Calls' are available in More Than A Fake Book.